HOBAS is on a quest to create bird friendly communities (along with other wildlife!) and one simple way to do this is in your garden. Conservation isn't just about protecting the obvious wilderness areas for wildlife, it is about creating a network of pocket habitats and refuges for wildlife that can provide food, shelter, water and a place to rear young, right in our own backyard! Download our "Landscaping for Birds and Other Wildlife" flyer quick tip sheet, and/or our handy "Native Plants" brochure, which contains information on various native plants as well as tips and resources. In addition, please read below for more information and resources! From the tiniest yard to a property with many acres…you can make your property welcoming to wildlife by removing non-native plant species and replacing with natives. 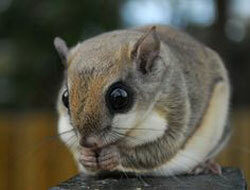 Provide food, water and cover and then sit back and enjoy the wildlife haven in your own backyard! 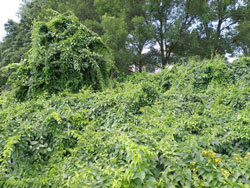 Many of our natural areas are in danger of being swallowed up by non-native plant species. These insidious plants threaten the ecological health and diversity of our ecosystems. According to the United States Department of Agriculture, an invasive species is one "whose introduction causes or is likely to cause economic or environmental harm or harm to human health." Non-native vines such as Japanese honeysuckle, mile-a-minute, porcelain berry, English ivy and oriental bittersweet will smother everything in their path, quickly climbing trees, where they aggressively compete for water, nutrients, and sunlight, preventing the tree from photosynthesizing, which can eventually kill the tree. These twining vines can also make the tree top-heavy and vulnerable to being toppled by wind damage. Autumn olive will quickly grow into a dense thicket, out-competing native plants. Other invasive plants such as mugwort will rapidly take over a field or grassland, creating an ecologically unhealthy monoculture. 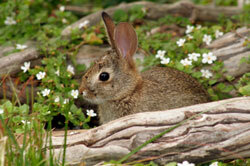 Most plants that are not native to North America provide very little benefit to wildlife here. These species have few, if any, natural enemies here and will swiftly crowd out and out-compete native plant species, altering ecosystems and causing a loss of biodiversity, thereby depriving wildlife of vital food sources and decreasing reproduction success. Native plants are critical because they support native insects, most of which are specialists rather than generalists and will not feed on non-natives. Insects are a critical food source for a variety of birds and other animals, particularly those raising young. A dearth of insects means a decline in bird species. Bird populations are in trouble throughout the world and invasive species are contributing significantly to this decline as habitat quality decreases. One 6 years study in Ohio determined that Northern cardinals paid a steep price when nesting in areas thick with honeysuckle: these birds reared 20% less young than did cardinals nesting in native plants. In addition, according to these studies, birds that ate the berries from these plants were artificially bright, signifying to females that they were good choices for mates. Normally male cardinals with a deeper red color are more fit because they are feeding on nutrient rich berries that contain carotenoid pigments. Honeysuckle berries contain lots of carotenoid pigments but are nutrient poor. Coloration becomes meaningless as a sign of quality in a mate with the results being that females are mistakenly choosing less fit males as mates. This can lead to population declines as less sturdy genes are passed on from generation to generation. Ready to attract birds to your garden or property? Plant native bushes, trees and other plants that provide food, protection from predators, resting spots during migration and nesting spots for raising young. 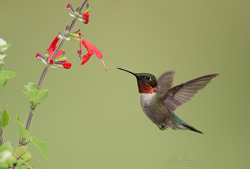 Go a step further...help protect pollinator birds, butterflies, bees and bats, many of which are in trouble, by planting an all native pollinator garden. Adding native plants to your garden is a wonderful way to help wildlife. Why help pollinators? According to the USFWS: Pollinators are nearly as important as sunlight, soil and water to the reproductive success of over 75% of the world's flowering plants. They are crucial to the production of most fruits, nuts, and berries on which people and wildlife depend. Over 150 food crops in the United States depend on pollinators, including blueberries, apples, oranges, squash, tomatoes and almonds. Monarch butterflies are especially vulnerable due to problems in their wintering grounds as well as a decrease in milkweed and other host plants. 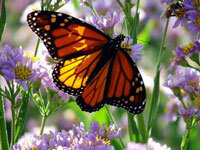 Help monarchs by planting milkweed in your garden and fields! Native plants are well adapted to survive in a particular geographic area according to the climate, soils, rainfall and availability of pollinators and seed dispersers. Because they are indigenous to a specific region, native plants usually require less maintenance and are welcomed by wildlife, serving an important role in the local ecosystem. Using native plants allows homeowners to use less water and fertilizer, because these plants may be already in the ideal conditions to grow well. Using native plants around the house is definitely the most effortless choice! Homeowners who choose native plants spend less time, energy, and money to maintain their landscaping. Less water and fertilizer means more time to enjoy your property instead of slaving over it! AND WHILE YOU'RE AT IT…DON'T REMOVE THAT BRUSH PILE! Don’t be so quick to remove a brush pile or rake up leaf litter. Yes, it seems to be just a jumbled pile of sticks, branches, twigs and leaves. But don’t let looks deceive you. This is what is known as a “brush pile” and it is important wildlife habitat. Birds, reptiles, amphibians, chipmunks, rabbits, opossums, woodchucks and other small animals need dense cover in which to nest, shelter, sleep and hide from predators. During the winter, when trees and shrubs have lost their leaves, animals rely even more on these sheltered areas. A pile of limbs, branches, twigs and leave creates critical wildlife habitat. Why not be a good wildlife host and create a brush pile in your own yard or property? For optimum habitat, brush piles are most beneficial when they are located at the edge of wooded areas, streams, marshes and yard borders that are near wooded or natural areas. Place it in an area of the property that will not create complaints from your neighbors, or better yet, explain to them how they too can help wildlife! When mowing, always check to make sure there are no Eastern box turtles in your path. 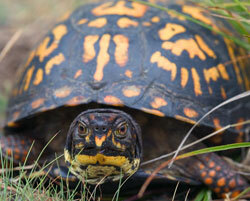 The NYS listed species are vulnerable to death by mowers, tractors and other farm equipment. Please do not engage the services of a tree removal company until after nesting season has passed. Cutting down trees can result in the inadvertent death of baby birds, squirrels, raccoons and other critters. Keep Fluffy indoors! For her sake as well as wildlife’s sake! Bird feeders can provide hours of delight for you and some extra assistance for your feathered friends! 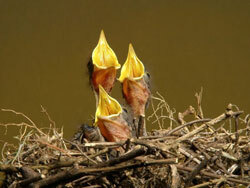 For tips on feeding birds, see resources list below. Provide water sources for wildlife. This includes birdbaths, ponds, water features and puddling areas for butterflies.